Posted on Tuesday, August 31st, 2010 at 6:30 am. Subscribe to the comments feed. Both comments and pings are currently closed. Post on your own blog. I can’t say I wasn’t expecting this – as a big advocate of OpenID (as you can see from this Lanyrd search http://lanyrd.com/search/?q=openid&people=simonw ) releasing something that’s entirely locked to a single identity provider was always going to be a controversial move. Here’s the thing though: I spent the best part of three years advocating OpenID not just because of a belief in openness, but because of the things I wanted to build with it. I wanted to build sites that already knew about you before you even signed in. I wanted to be able to pull in information about you and your relationships from other providers. I wanted to use your public, globally unique ID to share (non creepy) information about you with other sites. Then I got bored of waiting. By plugging in to the Twitter ecosystem I get all of those advantages, but I can actually build something successful and popular today. We did talk about building Lanyrd to be identity provider agnostic – accepting OpenID, Facebook and other things – but in the technology conference space it’s extremely rare to find a speaker who doesn’t have a Twitter account. The engineering and UI/cognitive effort involved in supporting multiple identity providers simply didn’t feel like a good investment of time. 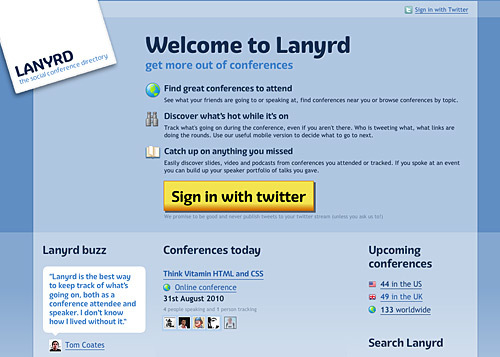 I think we’re doing some really interesting things with identity in Lanyrd – my favourite thing about the service is that you can add people as speakers at a conference via their Twitter name without them even having signed in to the service, but their followers will then see their appearances when they visit the site. Before launch, we had over 1,000 Twitter identities associated with conference speaking appearances (and in some cases book authorships). That’s my justification, anyway. Make of it what you will. I went ahead and added BarCampMilwaukee 5 to their conference databases. The only real issue I had, which is probably BarCamp/Unconference specific, is that there is no set line between staff/organizers/speakers/attendees. For most typical conferences though, those dividers probably work quite well. I like the BarCamp Milwaukee 2010 page. It makes me think I’m missing out by not adding my name to the list. Mine was first, but yours does appear to be more complete. I’ll see how I can go about merging/destroying mine. If Simon is still following this conversation, we found a glitch in the site. I used .com and Pete used .org, perhaps a “is this what you’re really looking for?” type test should be applied to cross-domain check. We’re working on better duplicate detection during the process of adding a conference, and we’re also building a merge tool (there are a few duplicates in there) to fix duplicates and redirect one to the other. Thanks for trying out the site! This is something we really need base libraries for. I am in the same situation, but in a market where no identity provider is used by the majority (non-techie audience, older people). Yet it’s great to have user information, so I don’t want to fall back to plain ‘ol stand-alone email + password signup. I’m kind of running into this with a social service right now, too. I don’t really want what I’m building to be *too* concerned with identity, and want to outsource it as much as possible to other sites that people call home. This looks especially ominous as I started playing with OpenID widgets that pre-build URLs for high-profile providers. This sounds like a job for webfinger – but I don’t think it’s quite there yet.